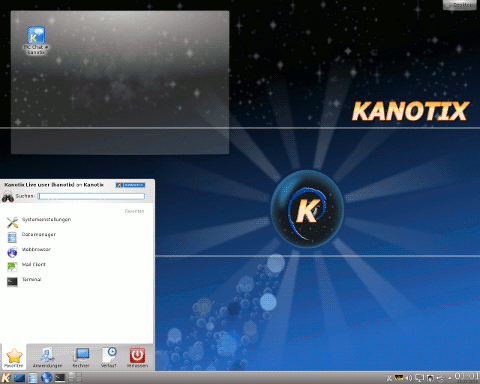 Rate this project A second preview release of the KANOTIX live CD is ready for download and testing: "Kano has released a preview of [KANOTIX 2006] Easter Edition. All packages are current Debian 'sid' as of 2006-04-16 - happy Easter! Highlights are: kernel 2.6.16.5 + patches, X.Org 7.0.12, KDE 3.5.2, KOffice 1.5.0, Firefox 1.5, Thunderbird 1.5. All problems of current Debian 'sid' packages for X.Org 7.0.12 where fixed for this preview release. The new artwork is not ready and will be in a following release. The only known problem at the moment is ISDN not working with X.Org 7, a fix is in progress." Here is the complete release announcement. Download from here: KANOTIX-2006-Easter-RC2.iso (633MB, MD5); also available via BitTorrent.